You may remember playing the excellent casual game designs offered by Toshiba in its "Classic Tobby" series that were reviewed here just over a year ago: Tobby Sling Shot, Tobby Crane, and Tobby Crisis. All of the Tobby games have one developer in common: Yoshio Ishii, and his work is generally remarkable as it usually includes unique gameplay rarely seen in Flash game design. There are three (3) other Tobby games up and available to play on the site, and each one deserves some attention. The first is Tobby Balance (FuraFura Tobby), a side-scrolling action game in which the core mechanic involves balancing Tobby on a stick while collecting jewels and navigating to the goal area for each level. Sounds simple, doesn't it? Using the mouse for control and as Tobby begins to tilt, move the mouse in the direction of the tilt to keep Tobby balanced on top. As the play field slowly scrolls, navigate Tobby around to collect the jewels, but don't be too hasty! Slow and steady movement is required to make it to the end of each level as there are an ever increasing number of obstacles to avoid. A simple, accessible and unique gameplay concept combined with challenging physics and excellent level design. All standard fare for an Ishii game. Click. Tobby Room 1048 is a unique cross between an action platformer and a classic Flash point-and-click adventure. The object is to find all eight (8) bombs hidden throughout the hotel, and to free all of the Jelly girls in the process. All text is in Japanese, though it's not difficult to figure out at all. A different take on a point-and-click, and another delightful Tobby game to while away the hours. Click. 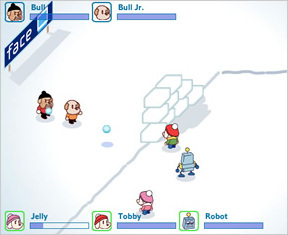 And finally, in Tobby Snow Fight (Tobby Yuki) take sides against Bully and his cronies in a snowball war to the finish. Controls in this game are a bit more complex than usual since you are controlling a trio of characters. Press the [X] key to select a character (or characters) to move. Watch the character icons in the lower left to see who is currently selected. Pressing [X] will cycle through each of the characters selecting them individually and then all of them as a group. Press the [Z] to throw a snowball. The longer you hold the key down the farther it will be thrown when released. Use the arrow keys to maneuver your peeps around to get a clear shot at the bullies. Collect the occassional power-ups with a character who is low in health to keep them in the game. Some good old wholesome seasonal Tobby fun. Click. And while some of these games are not new, they are new to Jayisgames and contain delightful casual game experiences I like to promote here. That and I am a big fan of Yoshio Ishii's game designs. =) You can play some of his "neko" (cat) games on his ece4co site. I have the code for the safe in Toby Room 1048 and have entered it, but nothing happens. I dont know what key to press to make it accept the digits i entered. Entering the code reveals a key in one of the rooms. How do you get the screen to disapear so you can visit more rooms? I'm assuming you mean after you've entered the combination on the control panel? Try pressing [space]. If you mean after viewing your inventory, just press [shift] again to toggle off the screen. Does anyone know what to do with the money? Do you have to give it to the turtle? how do u use the elevators? where are fuse boxes usualy? Question but it can spoil some parts so.. I have the code for the safe and looking at the paper, I'm guessing it should be in a certain order? And when I enter it in, I press space but nothing happens so I guess its wrong..How many numbers am I supposed to find? notice the torn edges of the numbers. Perhaps they used to be a single strip of paper? Arrrg. The Room 1048 is so frustrating. I still need to find uses for the money and radio and can't seem to find the "key" that is revealed in a room after I cracked the combo. So basically, where is the final key and what do I use the money and radio for? Dave: You need that last bomb, have you tried dropping on things from above? From the looks of Tobby Snow Fight, it reminds of that old game Snowcraft? Remember that one? Too cute!!!! What does it mean when we click on room 1048, and whats the turtle trying to say? I feel like I jumped onto and investigated everything I can... Of couse, I haven't because I only have 4 bombs, 3 digits and a key... Also I think I ate a bowl of some food... It didn't end up in my inventory anyway. Is it just me or did the speed of that balancing game increase dramatically since yesterday? It's funny you mention that, Daddaluma, as I had a similar experience when first playing it for the review; except my experience was just the opposite: the game at first was fast, then on subsequent plays it slowed to a more manageable speed. Help -- the boss fight at the end is HARD. bummer for me that i have eaten all the food (except the one from the fall on the broken floor) and one more fall on to skipes is gonna kill me. im gonna have to get that last food befoere the boss, i know, but still. hint on second number? This is driving me crazy. I can't find the spikes and flashlight everyone is talking about. Where are they? I'm where Coditor is. I have bombs 1, 3, 4, and 5. I have a key, sheets (in inventory) 1, 3, and 4. I've investigated everything I've seen, including lamps, and I can't find the flashlight. Well, I completed the game and never opened the safe. What was the purpose of it? Just catch a bomb and throw it back at him so that it touches him first thing when it gets to his level. It sounds hard but it really isn't. You have to do it multiple times before he's good and dead. And of course, that "classic Tobby" link above (http://www.toshiba.co.jp/digital/game/index.htm) has plenty of Tobby games, and a "Colorful Tobby" tab under which you'll find plenty more! Open the door (with Up) and walk inside. Free the worker and take the key--you'll need it to open the many hotel rooms you'll find. Exit the room and jump up the platforms. Free the worker, who says something about there being 8 bombs. (At least, that's what I'm guessing.) Walk to just above the chandelier and press Down to drop onto it, then search the support in the center with Up to find Bomb #1. Jump back above and walk right to the start screen. The elevator isn't working at the moment--the power seems to be out--but when you search the plant to the right, the Japanese that pops up is different from the normal searching message, and a chime is heard. After the text box closes out, hit SHIFT to bring up your inventory, and you'll see a piece of paper with the number 7 on it. It's one of the numbers for the combination lock--you'll find the other three as you go. Ignore the staircase for now and head right to the next screen. Drop down and free the worker by the elevator, and then take the staircase up. (You'll be back for the door later.) Free the next worker (who mentions using SHIFT to see your inventory) and then enter the bottom-right door. Check the vase for a number: a 4. Head back out and walk left to the next screen, passing the door which has nothing of use. You'll notice a gap with a chandelier. Jump onto the chandelier (if you fall, just walk to the right and take the staircase back up) and then to the platform on the upper-right. Go right to the screen with the four doors; you can now enter the top-left door, so do so. Search the television for Bomb #5 (according to the inventory screen) and leave. Using the platforms, head right to the next screen. (The top-right door has some stew, in case you need it later.) Drop to the bottom door, enter, and take the Heart in plain sight. Should Tobby run out of life, the Heart will revive him automatically, but only once! Exit and jump up to the topmost door. Jump over the Cake--you don't need it now--and search the dresser for the third number: a 6. The other two rooms have nothing of interest, so take the stairs up. Here, you'll find your first spikes and a door that's too high up to jump to. You can't reach it from this screen, so jump carefully over the first set of spikes and then up the small platforms to the stairs. Free the worker and enter the door which holds the Flashlight. Now walk slowly to the left. Drop off the platform, and then hold Right. You'll fall to the previous screen and onto the high-up ledge with a door. (If you miss, try again--this can be a bit tough.) Enter and search the bucket for Bomb #6. Now return to the screen near the start with the elevator and freed worker, and enter the door you passed up earlier. The room will darken, but your new Flashlight will light the way. Take the stairs down, check the dresser on the left for Bomb #3, and enter the door. It's pitch black: walk right until you see a lever, then pull it. The power will turn back on! Head all the way back to the elevator, open it by pressing the button, and enter. Jump up the platforms to the right and pass through to the next screen, where a long row of spikes stands between you and a suspicious vase. Using the small platform in the middle, cross the spikes and search the vase for Bomb #7, then cross back over to the screen with the elevator. If you were hurt, eat the stew here to restore some health, then walk left to a new screen with a tied-up worker and a long gap that can't be jumped at the moment. Free the worker and slowly drop off the edge, then hold Right. You'll fall onto a bucket with Bomb #8. Drop off slowly again to the screen below. Drop through the platform and search the television on the left for Bomb #2. Jump back up, walk to the screen on the right, and take the Speed Shoes, which will let you walk and jump faster. Carefully dodging spikes, head two screens leftward and drop down. Search the rightmost plant for a 2--the last combination number! Remember that large gap that was too wide to jump over? Well, head back with the Speed Shoes and jump across. Make some careful leaps to nab a Radio (?). Now go back to the front desk (where you started) and enter the door. Study the edges of your four pieces of paper. The 2, 4, and 7 fit together, but 2476 and 6247 don't do anything at all. However, that 6 is actually a 9! Flip that piece around and you'll find the code: 2479. The safe will open and you'll get Money! Go up the elevator you haven't used yet (on the same screen as the front desk). Up there is a talking turtle and--since you've defused all the bombs--a small sparkle. Look at it...it's the key to Room 1048! On the next screen, free the final worker and enter Room 1048. The game's namesake is larger and fancier than the other rooms--there's even a Bone here. Eat it, and walk to the right. You'll be greeted by Bull and a tied-up Jelly. Bull will shout at you from his perch above, and then he'll start throwing bombs at you. Catch all the bombs Bull tosses and use Up to throw them back. (Jelly will tell you this if you go up to her, but it's not much help if you don't speak Japanese.) Deplete Bull's life, and you've won! As for the line breaks in the spoiler tags, you will need to add your own <p> tags or <br /> to format the spoilers the way you want. I used paragraph tags with your walkthrough to make it a bit more readable. cheers! Ha, wow... thanks for the walk-through. I had got everything but the key which *gasp* was your first step on there. Lol, I have no idea how I missed that room at first. Hummm. I clicked on the links but I kept getting sent to the same place which is a tobby game, but it is a game designed to help with typing skills. Not the games that you have posted. Has the link changed in such a short time? It there another place? I had that same problem! someone plz help! FYI, anyone who wishes to geta copy of Tobby Room 1048, i have downloaded the flash long ago and i play it on my computer without need of going to the Toshiba site, just shoot me an email. Is there something interesting in instructions in the game Tobby Balance? Unfortunately I do not know that language. There are also some comments inside the game and I have no idea what they say. Can anyone translate it here? ?